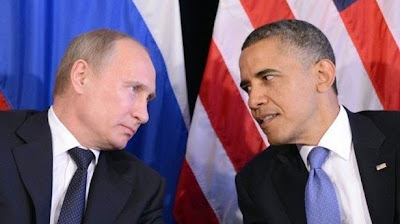 While President Obama is conferring with Russian President Vladimir Putin at the G-20 economic summit in St. Petersburg, Russia, current and retired senior American intelligence officials fear he is blind to a growing threat from a resurgent Russia. These officials say that Moscow continues to probe America's skies and seas with bombers and submarines, both to assert itself and to see just how far Russia can push Obama. In June 2012, Russian strategic nuclear bombers broke protocol and conducted maneuvers in the Arctic without alerting the U.S.
A month later a Russian Tu-95 Bear-H strategic bomber, capable of carrying nuclear-armed cruise missiles, entered American airspace off Alaska and California. Then in August, a stealthy Russian Akula-class attack submarine, designed to hunt and sink American subs, patrolled for weeks off Texas, Louisiana and Florida. Accelerated strategic weapons modernization to enhance the ability to blackmail the U.S. and its allies with thermonuclear destruction. Despite its own sagging economy and massive U.S. defense cuts, Russia is upgrading its Soviet-era weapons and building new systems superior to America's. At the sprawling Sevmash shipyards in the Arctic port of Severodvinsk, Russian workers are busy building the world's most advanced nuclear missile-firing, Borei-class submarines. To the south, at the Votkinsk Machine Building Plant in Russia's Udmurt Republic, technicians assemble Bulava ballistic missiles to be launched from those subs. Their purpose: to deliver high-tech thermonuclear warheads to incinerate American cities. The Borei-class submarines will be armed with between 16 and 20 of the latest Bulava missiles, each capable of carrying between six and 10 nuclear warheads. "The one thing that keeps Russians in the big boys' club is their strategic nuclear force," former CIA director Michael Hayden told American Media Institute. "It's not at all surprising that's something that continues to receive investment." "The president has to communicate to the Russians that he's tougher than he appears to be in public," argues Robert W. Stephan, a former 20-year CIA veteran. Instead, the Russians see a pattern of weakness under Obama, analysts say. As president, Obama has sought to reassure the Russians on many fronts. Unilaterally, he has slashed the U.S. tactical nuclear weapons arsenal. He has pulled the plug on anti-ballistic missile systems for Poland and the Czech Republic. His defense budget has plummeted since the last year of the Bush administration. Still the Russians want more. Following a 90-minute closed-door Obama meeting with Putin's stand-in president, Dmitry Medvedev, in March 2012, an ABC-TV microphone picked up Obama pleading: "This is my last election. After my election, I have more flexibility." Replied Medvedev: "I understand. I will transmit this to Vladimir." Moscow's real push forward began with Obama's first election in 2008. "Moscow is now setting its sights on long-term challenges of rearmament and professionalization," says the nation's top intelligence officer, Director of National Intelligence James Clapper. "In 2010, a 10-year procurement plan was approved to replace Soviet-era hardware and bolster deterrence with a balanced set of modern conventional, asymmetric, and nuclear capabilities." Few expected Obama to raise concerns about Russia's intensive nuclear weapons drive with Putin, the summit host. Obama recently canceled a one-on-one meeting with the Russian leader to protest Moscow's granting asylum to intelligence defector Edward Snowden. But Obama's back-and-forth vacillating on Syria, a Russian ally, is "very dangerous, because misreading American intentions and capabilities may invite accidents," says Herman Pirchner, president of the American Foreign Policy Council in Washington. "Provocative weakness" is how analysts describe Obama's foreign policy. "Provocative weakness is a state in which you look weak, and you inadvertently provoke Russia, and others who mean you ill, into thinking they can grab something for nothing," says Pirchner, who has made scores of visits to Russia for meetings with officials and who has hosted hundreds of Russian representatives in Washington. By not making an issue of Russian espionage, the U.S. is costing American companies their competitive edge and their bottom line, agree a wide variety of experts. "Our corporations and businesses are easy victims," says S. Eugene Poteat, a former CIA officer and president of the Association of Former Intelligence Officers (AFIO). "The U.S. has been, and still is, the most spied-on nation in the world, because we are the greatest source of high technology R&D and intellectual property." Obama should press Putin on the issue, former CIA Director Michael Hayden believes. "When they're stealing money or private intellectual property, that's not accepted international practice. We have a right to be angry, and to hold Russia to certain standards of behavior." "All states conduct espionage," says Hayden. "But what we see in Russia is an awful lot of cyberespionage done by what I would call hired guns, criminal gangs." Director of National Intelligence Clapper has been vocal in warning Congress. In testimony before the Senate Select Committee on Intelligence, Clapper equated Russian espionage against the U.S. with international organized crime and terrorism, "undermining our economic and technological advantages, and seeking to influence our national policies and processes covertly." "Cybercriminals are determined to prey not only on individual bank accounts, but on the financial system itself," New York-based U.S. Attorney Preet Bharara said when announcing the indictments of two Russians awaiting trial for hacking into large U.S. banks and the NASDAQ. U.S. prosecutors did not allege that the hackers were tied to the Russian government. Yet Bharara's aggressive work against the cybercriminals so offended the Putin regime that earlier this year it formally banned the federal prosecutor from visiting Russia. After years of resisting the idea that the Russian intelligence services were a part of the international organized crime problem, U.S. intelligence has since concluded that the threat is real. Clapper told the Senate in March, "In Russia, the nexus among organized crime, some state officials, the intelligence services, and business blurs the distinction between state policy and private gain." Eleven alleged members of a Texas-based procurement network for Russian military and intelligence services are awaiting trial in New York for having illegally exported $50 million worth of top-secret U.S. microelectronics for the Russian military and spy services. According to the FBI, the microelectronics are critical to "a wide range of military systems, including radar and surveillance systems, weapons guidance systems, and detonation triggers." Few of either party, in the White House or on Capitol Hill, have shown much concern as Russia has progressively replaced its aging Soviet nuclear arsenal with state-of-the-art systems. Obama should alert the public to Russian strategic nuclear modernization, former senior officials argue. "It flies in the face of our president's very deeply felt commitment to move toward a nuclear-free world," says Hayden. "Here we have the Cold War adversary ... trying to modernize their strategic weapons. " Moscow built loopholes into new arms-control treaties while developing weapons systems to exploit those openings that escaped U.S. scrutiny. One example: Mobile ICBMs based on railroads were banned under the bilateral Strategic Arms Reduction Treaty, but when START expired in 2010, the Russian military was already developing a new, rail-based ICBM that will be legally deployable under the New START treaty, which went into force in 2011. The Obama administration did not formally object to the new Russian weapons. "The Kremlin sees arms control treaties as a means of locking in its technological superiority and hamstringing the United States," says former CIA officer Stephan. Russia has the world's most sophisticated strategic nuclear missile force. It has completed its deployments of the SS-25 Topol and SS-27 Topol-M ICBMs, with versions in fixed silos and on hard-to-target mobile vehicles. It is now deploying the next-generation SS-29, with carbon filament fuselages and fast-burning solid fuels that make them difficult to detect when launched, low ballistic trajectories that make them hard to spot when in flight, and with multiple warheads that can take independent evasive action against present and planned U.S. missile defense systems. Russia's new-generation submarines can launch missiles at the continental U.S. while submerged and moving, making them very difficult targets for the U.S. to detect and counter. When all eight planned Borei-class submarines are deployed, they will carry a total of up to 1,600 nuclear warheads, all designed to evade American ballistic missile defense systems. The main concern with Russia's nuclear modernization is not that Moscow will attack the United States, but that it will use its nuclear superiority and negative diplomacy to bend the U.S. to its will - or at least prevent the U.S. from defending its interests and allies. An internal House Armed Services Committee staff memo voices concern that "for the first time in seven decades, allies and adversaries will question our ability to provide a nuclear response to an attack," making the value of U.S. deterrence strategy useless or, in the case of provocative weakness, dangerously inviting to a potential aggressor or miscalculation. Russia-watchers are concerned that, by failing to provide tough-minded clarity, President Obama could inadvertently be provoking a fantasy-driven Kremlin. "Our nation wouldn't risk getting into such trouble if the president made credible statements about vital U.S. interests," says Pirchner. "Now the credibility of Obama is not what it should be to give American diplomacy maximum leverage." J. Michael Waller is a senior writer at the American Media Institute and a former adviser to U.S. intelligence agencies and U.S. Special Operations Command.